We are continuing our study of the Gospel of Luke and today we are looking at Luke 9:10-17 and an event called the Feeding of the 5,000. This is the only miracle of Jesus that is recorded by all four Gospel writers: Matthew, Mark, Luke and John. It takes place in the region of Galilee, an area which is in the northern part of the present-day nation of Israel. Just prior to this event, Jesus had sent out his twelve main followers with his power and authority to preach about the kingdom of God, to drive demons out of people and to heal the sick. The word “apostle” means “one sent with authority” and so these twelve men acted on Jesus’ behalf as his representatives, just like an ambassador is sent with the authority of his or her government to act that country’s representative in the country where they are posted. Now those twelve apostles are back and they excitedly tell Jesus about all the wonderful things that happened as they served as his ambassadors. Jesus wanted to spend some time with the Twelve to help them process what had happened, so they went to a remote area near a town called Bethsaida. Bethsaida was home to three of Jesus’ disciples: Andrew, Peter and John. The name of the town Bethsaida means “house of fish” and while scholars are not 100% sure of the location, most likely this town was on the northeast side of the Sea of Galilee. Somewhere near that town, Jesus and the Twelve go off by themselves to spend some time together. But, at this time in his ministry, large crowds of people are flocking to hear Jesus speak and have him heal those who are sick. And it happens again here. Jesus has had his plans interrupted, but note what he does. He welcomes the people. Everyone is welcome in Jesus’ world. It doesn’t matter how young you are. It doesn’t matter how old you are. It doesn’t matter if you are a world class athlete or if you are confined to a wheel chair. It doesn’t matter if you are rich enough to buy a country or if you are so poor that you don’t have two pennies to rub together. Jesus opens up his arms and welcomes everyone. As Jesus continues teaching and healing and the day begins to wind down to a close, the Twelve realize that there is a huge need right before them. There are five thousand men, plus women and children out here in the middle of nowhere and there is no food to feed them. The situation was reminiscent of a time centuries before when there were six hundred thousand men, plus women and children (cf. Exo. 12:37) out in the desert with no food to feed them. In that situation, God miraculously provided manna each morning which the people gathered from the desert floor and each person had enough to eat. The apostles tell Jesus about the need and they also suggest to him a solution: “Send the crowd away so they can go to the surrounding villages and countryside and find food and lodging, because we are in a remote place here” (v. 12b). But Jesus responds with a totally unexpected and very challenging reply: “You give them something to eat” (v. 13). At first hearing, Jesus’ reply seems a little bizarre and almost mean-spirited. He seems to be demanding that the apostles do what is impossible. But he is not. For Jesus knows that the twelve apostles already have all the resources that they need to feed the large crowd not only to satisfaction, but to overflowing abundance. The apostles already have all the resources that they need because they have Jesus. And so they give what little they have to Jesus, five loaves and two fish, and Jesus, with actions that are very similar to those he did at two other significant evening meals, the Last Supper and the meal at Emmaus, took the food, looked up to heaven, gave thanks, broke the food and gave it to the disciples to set before the people. 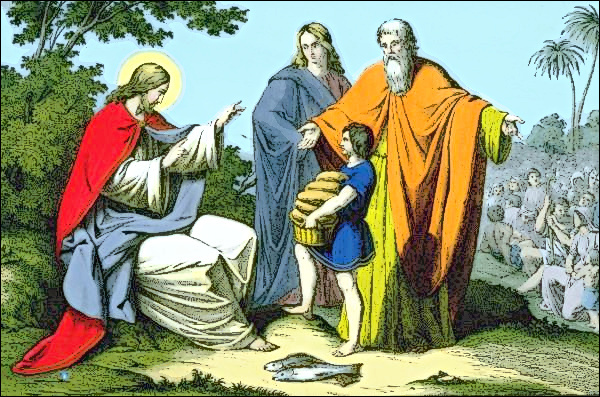 The disciples took the food Jesus gave them, gave it to the groups of people and then went back to Jesus for some more. And Jesus kept giving and giving and giving until there was more than enough food. By the time the meal had ended, everyone was satisfied and there twelve basketfuls of food left over, one for each of the apostles. What Jesus did in that remote region nearly 2,000 years ago was miraculous, but for those who know him in a deeply personal way, it is not so unusual. For true abundance is found in Jesus. Let me give you an example from ordinary human relationships. When I married Susan, I had no idea what the future might bring, but I knew that I wanted to spend the rest of my life with her. What I have discovered it that my life has been immensely enriched because of my relationship with her. My life is enriched emotionally because of her care, her confrontation and her love. My life is enriched relationally because of my relationship with her and all the relationships that I gained through her: with our children and all my in-laws. My life is enriched physically because of her physical care for me. My life is enriched financially because we are pooling resources. And my life is has greater meaning because we are working together towards a common goal. Now imagine how your life is enriched when the person you love and the person who loves you is the infinitely powerful, all-wise Redeemer of the world. Because Jesus does for you what no other person can. He gives you the wisdom you need to deal with whatever challenges you face in life and his love and graciousness, he powerfully manoeuvre circumstances in your life so that all things work together for your good. That’s the life that Jesus wants to give to you and that rich, full, abundant life with Jesus will last forever. And he is inviting you to begin living that life right now. All you have to do is trust him. Jesus is still in the business of doing impossible things through ordinary people. Several years ago, Lynn Gergens, our Director of Youth and Family Ministry, was teaching a Confirmation class of teenaged students about the Lord’s Prayer. Lynn shared with the students regarding how there is enough food in the world to feed everyone if the present world food supply was evenly distributed. And yet there are thousands of people around the world who die of starvation every day. Then she asked the students if God was being unfaithful to his promise to provide Daily Bread. The students realized that the unfaithfulness is on the part of humanity because some of us have much more than we need, while others do not have enough to survive. After Lynn shared about the hunger challenges that exist right here in Vancouver, one of the students said, “I want to hand a sandwich to a hungry person.” That started our Inner City Ministry here at Walnut Grove Lutheran Church where we take food and clothing down to the Downtown East Side twice a year. Over the years about 4,000 people have been fed, but more importantly relationships have been built and the lives of our young people have been changed by the experience of caring for the least of these. True abundance is found in Jesus. And we see that abundance here today on this altar. Jesus is here with all of his abundant love and forgiveness. Together with the bread and the wine, Jesus gives us his body and his blood. Whatever it is that you think you lack, Jesus has something far greater and far better for you. It’s Himself. And he invites you to give him whatever you have. He is not asking for your possessions, your money or your food. He is inviting you to give him your life. But he will take your life, look up to heaven and bless it, do a miraculous multiplication, and then give it back to you to do amazing things in the world. Amen. Russell D. Moore, “A Purpose Driven Cosmos,” Christianity Today, (February 2012, 30-33), 33.